WAFFLES: Hey Boss! How about dinner and a movie? KATIE: That's sounding an awful lot like a date, Waffles. WAFFLES: I don't have to. The nice Canadians sent us a whole bunch of food! KATIE: You mean the nice people at CANIDAE. Who, for the record, are from California. WAFFLES: I didn't know there were Canadians in California! KATIE: Now Waffles. Let's get one thing straight. This is NOT a date. WAFFLES: Right, Boss. Not a date. KATIE: And I don't want you thinking you're going to get any "dessert" action afterwards. WAFFLES: Right, Boss. No dessert. No action. KATIE: No physical contact whatsoever. What you're seeing is real. Not staged. Not even Photoshopped. In fact we just might be onto something. Maybe if our world's leaders came together over a plate of chicken pate or a bowl of turkey & rabbit with gravy, there'd be a little more peace and harmony. 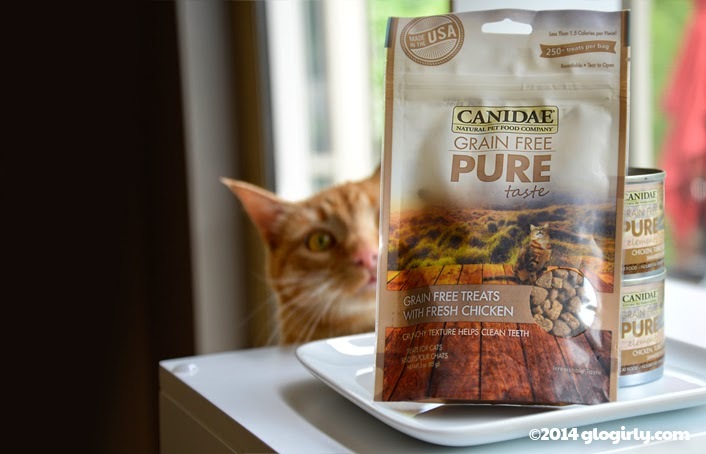 In the meantime, we're just going to enjoy our latest foody finds from CANIDAE. And if you stick with us, you just might have a chance to enjoy some delicious dinnertime peace of your own! 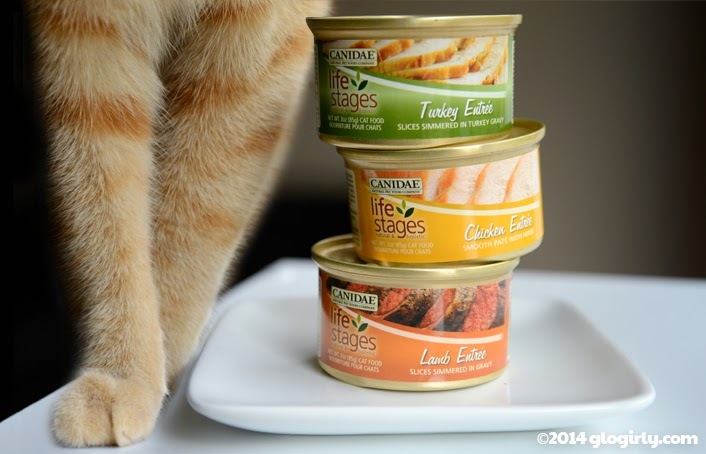 We had an opportunity to sample three lines of Canidae's canned food for cats, as well as their crunchy, grain free treats. I was so distracted with how yummy everything was, I didn't even realize Waffles had his nose in my dish. Each of CANIDAE's recipes come in a variety of flavors. We're big fans of poultry here for our daily protein and there were lots of great options to choose from. Fish lovers won't be disappointed either. Textures range from smooth pate to tiny slices in gravy. We honestly enjoyed every single flavor we tried and are proud members of the Clean Plate Club. One lucky GLOGIRLY reader will win every recipe and flavor WE tried! 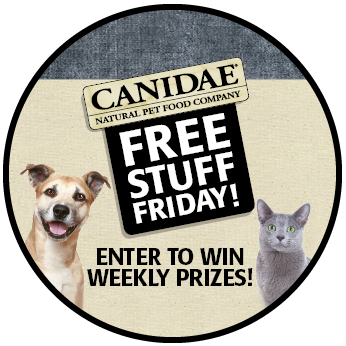 Each week on Facebook, CANIDAE is giving away some tasty prizes. You can learn all about it just by liking and visiting their Facebook Page. 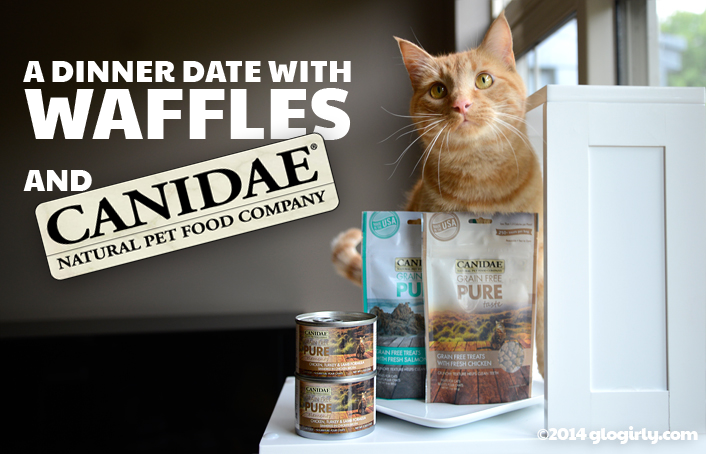 We received our food & treats at no charge from CANIDAE. We also received a small fee to cover the time it takes to photograph the products, write the review and administer the giveaway. Receiving the food and fee did not influence our article or anything we say. We only feature products and services on GLOGIRLY that we love. All sponsored posts on GLOGIRLY reflect our honest and unbiased opinions. Oh, we'd really like to win cos The Baby has to eat new foodables! Mommy wants to know how much a can costs. My kitties love this stuff!! That must be some special foods for you to actually eat with Waffles, Miss Katie! Glogirly had to step in as referee to ensure equal portions and guard agains hoarding. We don't know which is better- getting all that food or dinner with Waffles. For example, (12) 5.5 ounce cans of the PURE Chicken, Turkey & Lamb is $18.99. That's $1.58 each. Pretty good for a 5.5 oz. can. I would love to win this. I love that they are doing a rabbit flavor, my kitties all love it. I love seeing them that close and actually eating together. Must be pretty darn good food! Yay, this is a food I actually EAT! So I'm entering. We are amazed that you two are sharing a nom!! We liked their treats so we're in. We are definitely fishy fans here. Not sure if its only open to US readers but was so distracted by the shared eating and then Waffles gorgeous legs in the pic I quite forgot to check! Wow!! Maybe out sister would want to eat with us two boys if our mum served this yummy food up to us. Wow, that is awesome! Shiner really likes their treats too. Oh and Waffles, your tongue looks really big! Wow! You're actually eating off the same plate!!!!!! We'll enter!!!! WOAH.... *awed* *awed* That stuff must be made of MAGIC. 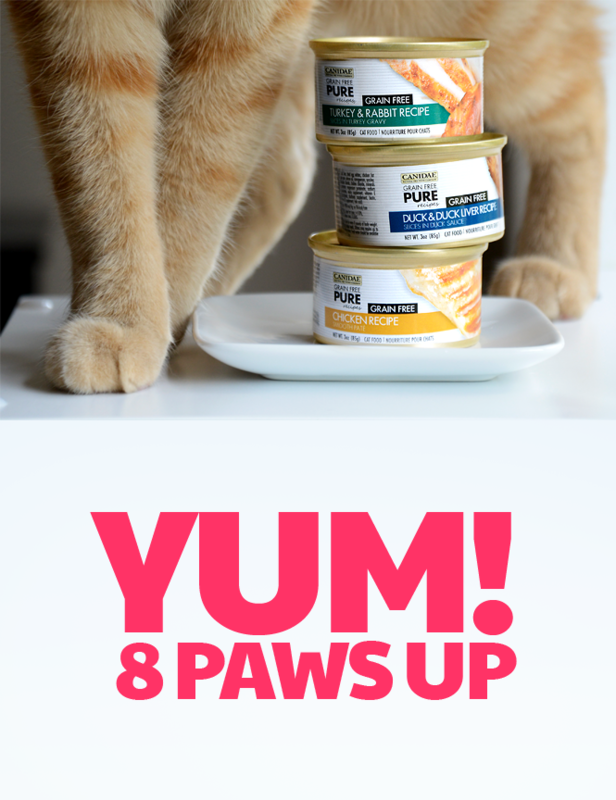 Well, we're big salmon eaters at our house, but that's only in the treats so of the canned flavors, we'd go with chicken. The Chicken Recipe is def our favorite. Thanks so much for the chance! Peace at last! I love how the ears are pinned back...NO TOUCHING :). Any fish flavor is our fave! Around here Turkey is the only thing agreed on by the four. 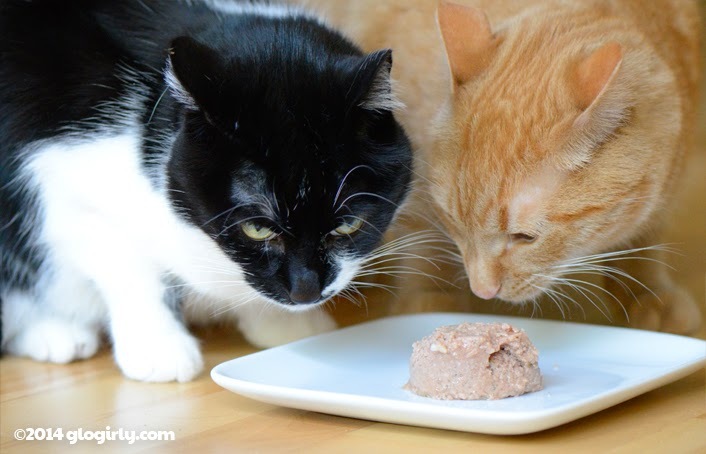 We reviewed the treats and loved them! 'Specially chicken! But we haven't tried the foods yet and want to! 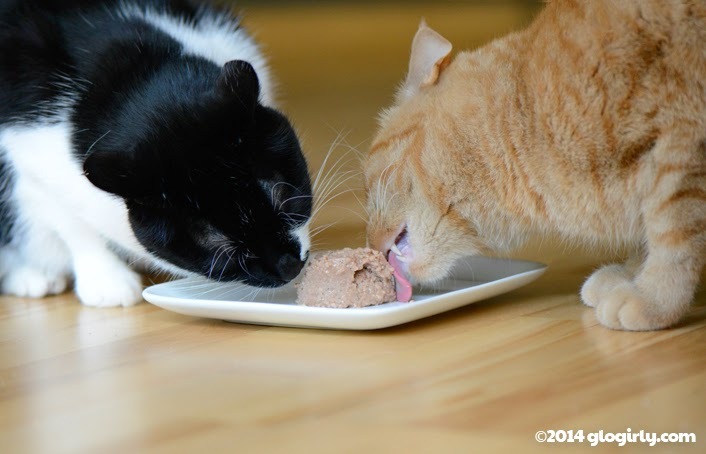 We would love to try that delicious looking noms! OMC - you are both eating off the same plate??? Should we prepare for the apocolaypse??? We would love to try these noms. Our favorites are turkey and chicken. Anything bringing Waffles and The Boss together has got to be great. And chicken. Some seriously good looking meat choices, too - trout and lobster?! Wow. Gotta see if the kids like that as a treat! Anything bird will entrance my two furballs! We're in on this one! Must be pretty tasty if they are sharing the same plate. We are always looking for grain-free food to try. We are curious about the lamb variety. Fleurp says Duck duck duck! I wonder where the goose is..
My furbabies would love any of the bird flavors and even the fish. Bu right now they seem to like the bird now. We nearly fainted when we saw you two sharing a plate! That stuff must be pawsome. Waffles and Katie sharing a plate? What's in that food??? Where can we get some? Our favorite flavor is rabbit!!! YUM! You guys make this food look delicious! Look at that tongue action on Waffles while Katie is eating so daintily. I like tuna. We like poultry flavors here! Candy and I like chicken best. EK likes duck. We have dried rabbit treats that we like, so I bet we'd like rabbit, too. We don't really know cuz Mom won't let us eat the rabbits in the yard. Looks like somekitty's favorite is Chicken & Waffles..Oh Miss Karie..mol..We are not going to enter because we just won a big prize but good luck to everyone..It must be some good food if it can cause miracles to happen..MOL!!! Awwww so sweet!! Love these pictures! There are actually a lot of Canadians in California. I once read somewhere that LA is one of our biggest cities. Think it might have been a BIT of an exaggeration, though. Those look tasty, especially chicken. We love chicken best! I can't BELIEVE you kids are eating together and not eating each other! Ha ha meow! That stuff must really be kitty crack! Yum! Canidae has some of the best food around! Tabby was sponsored by them for a year, and we all LOVED their food. It's no surprise that you were distracted by its flavor, and let Waffles eat with you, Katie. Oh, and our favorite flavor is the CHICKEN! This one is just for the kitties. Yummeh chicken and turkey and... Waffles!!! Thunder would love to try a rabbit! Food brings people and apparently kitties too together! Stay on your side Waffles!! That is pretty impressive, the two of you eating in harmony. Mom is going to go check out their website. OMC Weez been wantin' tu twy this. being a boxer, they all sound de-lish but i get yelled at every times i steal the cat's food. So i asked one of the 8 cats who lives with me (rent is expensive, had to get roomies) and he said the duck and liver would be delightful, thank you. I'm thinking Turkey & Rabbit! My 2 kitties would love turkey & rabbit! mhm..
My cats enjoy poultry variety. My favorite flavor is Lamb Entree; I have three cats and one has food allergies, so this would probably be good for him.